There’s more to buying sunglasses than just plucking a pair off the rack. If you want something that’s both fashionable and functional, you’ll need to be a little bit pickier. Here are just five tips for buying a high-quality pair of sunglasses. Most sunglasses come in oval shapes, but there are many others on the market. For example, round sunglasses will give you a hipster look while square-cut sunglasses will be ultra-stylish. You can also look into things like wraparound shades that will protect your eyes from all angles. You can find sunglasses in every color of the rainbow, so don’t feel like you have to settle for a shade that you don’t enjoy. If you’re a fan of hot, blazing pink, you can buy sunglasses like that. If you want leopard print sunglasses in neon orange, there’s definitely a pair like that somewhere. There are even camo sunglasses for the military fashionista! The ideal sunglasses will protect you from both UVA and UVB rays. They’ll also block out more than 90 percent of incoming light so that your retinas aren’t stressed by the sun. If you don’t feel like squinting at labels, just look for a pair of sunglasses that says “UV 400.” This means that they’ll protect you from up to 400 nanometers of light, including the stuff from UVA and UVB rays. Sunglasses can run the gamut from very cheap to shockingly expensive, so it’s up to you to decide where your financial limits are. If you wear glasses in your everyday life, maybe it’s worth the expense of buying tinted ones. If you break a lot of shades, you might want to invest in a pack of wholesale wayfarer sunglasses. If you find a pair of sunglasses that you like, look them up online and see what other customers are saying about them. Are they prone to breaking? Does their color fade easily in the sun? Do they really offer the range of protection that they promised? These are the kinds of things that you’ll want to know in advance. Before you hit the beach this summer, make sure that your eyes are covered from the sun. Use these five tips to buy a pair of functional yet affordable sunglasses. This entry was posted in fashion on September 11, 2017 by simplyjess. My Filipino co-worker always invited me to shop at Fashion Outlet Mall in Niagara Falls. She keeps on saying that it is very easy to drive all the way there. I have not visited that mall not even once. She told me that prices are so affordable compared to any malls. One day lasts week when we both were off from work, I told her that we are going to the mall. Indeed! It is very easy to drive to get there. Though is kind far but the driving is not bad. It only turned once and the mall is there. I cannot believe how the prices are very affordable. There are many stores to visit. My daughter is with us too because she loves shopping. I am so glad that Victoria’s Secret is in that mall. We shop around and found some amazing deals. I shopped at Aeropostale. 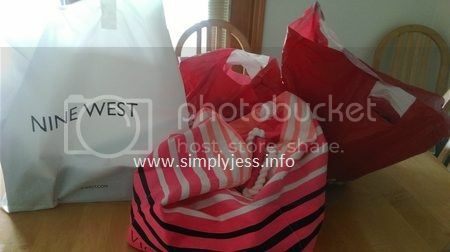 Nine West, Gap and my daughter bought something from Claire’s. I need to be back by myself and explore that mall by myself especially that I am heading Christmas vacation in the Philippines. This entry was posted in fashion, shopping and tagged Aeropostale, Claire's Nine West, Gap, Victoria's Secret on June 3, 2017 by simplyjess.